The host presents a round-up of the recent news, events, updates and developments. 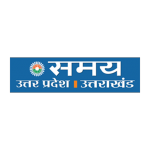 The Samay Uttar Pradesh Channel was launched on the 28th March, 2003. It was the first attempt by any 24x7 News channel to cater to a regional viewership in the country. It did not take long for the channel to create a distinct niche in terms of viewership in the two states of Uttar Pradesh & Uttaranchal. The channel''s strength has been to provide in-depth regional content, aided by the latest of technologies. The Samay Uttar Pradesh also provides access to numerous advertisers and media planners, who want to communicate their products and services to some of the largest captive audiences within the vast market of Uttar Pradesh and Uttaranchal. In fact, some of the biggest brands in the country are already associated with the channel.